It’s unimportant how many cigarettes you smoke, or how long you have smoked cigarettes for, This unique 100% evidence based approach to helping you stop smoking will make the whole process painless, easy and fast, typically only one to three sessions are all that’s required. You do need to be committed to the process, be prepared to put 100% effort in and take FULL personal responsibility for stopping. Philip believes most smokers have often just lost the belief in their own ability to stop smoking by the time he meets them. After several failed attempts to stop smoking people have usually built up a belief system that makes it seem as though it’s going to be really difficult to stop smoking. A wide range of psychological techniques are used to help break down your beliefs and preconceptions about stopping smoking, provide you with the psychological strength, skills and resilience you need for the long term. You will be taught skills & techniques to overcome any cravings you may experience and teach you ways to stay calm and relaxed during those first initial days without cigarettes. Philip does not always hypnosis during these sessions, the only time this technique is used is with clients who are likely to be good hypnotic subjects and who are suggestible. “Four weeks today, so far so good. Thank you for having helped me to change my life. Fingers crossed I can keep it up. My daughter is over the moon”. 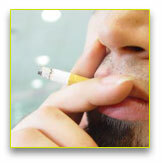 “I’m still a non smoker despite a sudden death in the family and the cat becoming ill. I could never have done it without you”. In almost thirty years of practice in Jersey in the Channel Islands, Philip has helped hundreds of people to successfully stop smoking. Click here to contact Philip Blake (Registered hypnotherapist and psychotherapist) today or call 01534 506959 to book your appointment.